When European explorers first saw these strange hopping animals they asked a native Australian (aborigine) what they were called. The explorers thought this was the animal's name, and that's how the kangaroo got its name. 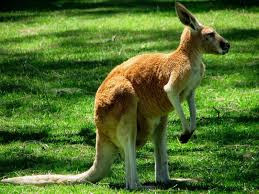 A Kangaroo is a marsupial mammal. It is a macropod which means "big foot". There are over 40 different types (species) of Kangaroo. The smaller ones are usually called Wallabies. The largest is the Red Kangaroo. It stands taller than a man and can weigh 85 kg's. It is the largest marsupial in the world. Kangaroos are native to Australia. They're good at adapting so they can live in a variety of habitats — in fact, they're often found in public parks, gardens and even golf courses. The Red Kangaroo is found in arid and semi-arid regions, where they eat green plants. Their populations shrink during droughts because their food supply literally dries up. The Western Grey Kangaroo lives in open woodlands, shrublands, grasslands and even pasturelands in Australia, from the Indian Ocean to western Victoria and New South Wales. The Eastern Grey Kangaroo lives in forests, woodlands, shrublands and grasslands in eastern Australia and Tasmania. The Antilopine Kangaroo is found in monsoonal tropical woodlands in the northern part of the continent.